The IGA Kendo Club is proud to officially acknowledge their new set of dan-holders from the Arena Fitness Dojo. The dan certificates finally arrived from the Hong Kong Kendo Association last July 10, 2014. The said certificates were then presented last Saturday, July 12, 2014, to their very deserving recipients during a small ceremony after practice in the Arena Fitness Dojo. 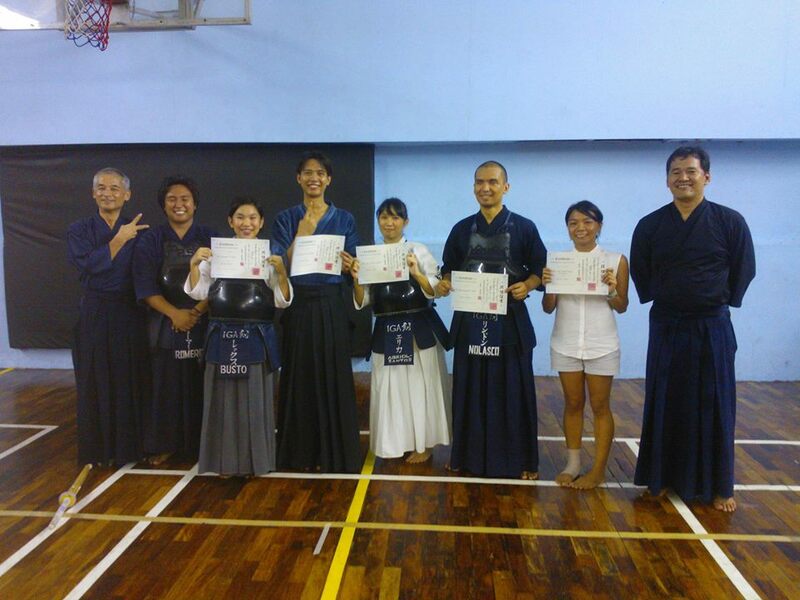 From left to right: Igarashi-Sensei, Jomar (nidan candidate), Lex (new nidan), Rikki (new nidan), Erica (accepting the nidan certificate on behalf of her sister Dardsie), Lyndon (new shodan), Ice (new shodan), Kutch (dojo manager). Not in the picture is Josh (new shodan). On the same day, the club welcomed to the Philippines a visiting sensei, Mr. Kawaguchi, a 7th-dan holder from Kyushu. After practice he expressed his happiness for practicing with IGA Ken, and his admiration for the club’s emphasis on trying to teach Kendo in the proper manner. We certainly hope that he can visit us again in the future. This entry was posted in About, Events, Instructors, Kendo, Milestones, Stories / Testimonials and tagged Arena Fitness Dojo, Arena Fitness Inc, basketball court, blogging, dan exam, dan holder, hong kong, hong kong asian open, Iga ken, Iga Kendo, IGA Kendo Club, Igarashi, Igarashi Sensei, jigeiko, keiko, kendo, Koji Igarashi, Martial arts, nidan, Philippine Kendo, Philippines, Quezon City, shodan, sports. Bookmark the permalink.